Russia could become the third largest participant in the China-led Asian Infrastructure and Investments Bank (AIIB) and enter its board of directors, said Stanislav Voskresensky, Deputy Minister of Economic Development. “According expert estimates, Russia ... claims to be the third largest participant, which means it could gain a seat on the board of directors,” Voskresensky told Rossiya-24 TV channel on Wednesday. That means Russia will be able to influence the bank’s policy and, together with its partners in the Customs Union, offer interesting projects for the bank to fund, he added. The Asian Bank for Infrastructure Investment (AIIB), established in 2014 by China, will finance infrastructure projects like the construction of roads, railways, and airports in the Asia-Pacific Region. 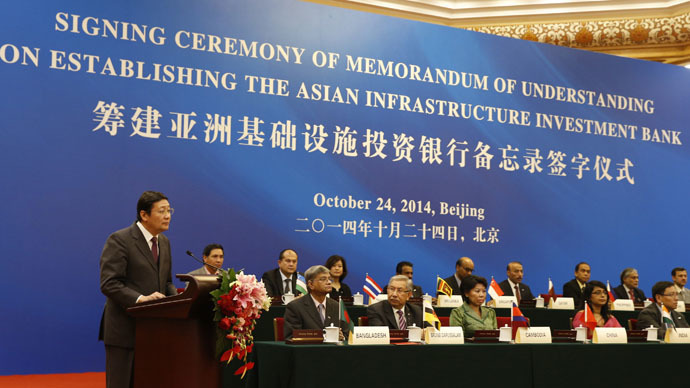 The initial subscribed capital of AIIB will be $50 billion and there are plans for it to be increased to $100 billion. The bank, with its headquarters located in Beijing, is expected to start its work at the end of 2015. The number of founding members has reached 57. Russia received the status of founding member on April 14, 2015.